How to create a discount for a family with more than one child playing at the club. 1. 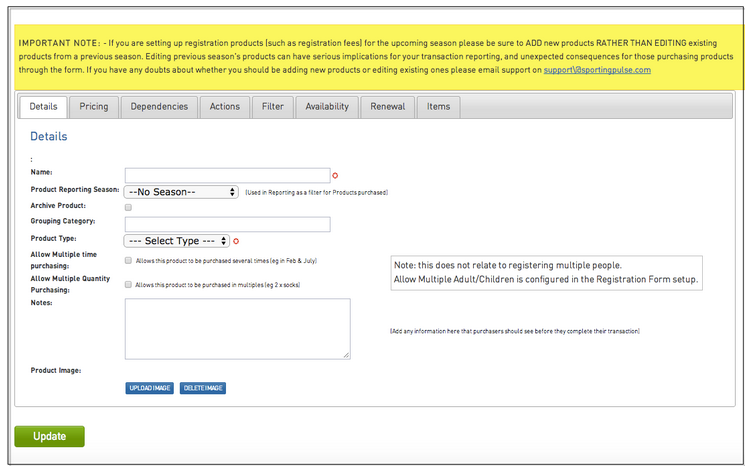 From the club level of the database, click on Registrations in the menu and select Products from the drop-down menu. 2. Click 'Add a New Product'. 3. Complete the 'Details' section. 4. Once in the 'Pricing' tab, choose 'Multiple Prices' and add in the amount to both adult and child columns and click update. The discount will appear when the second member is prompted to fill in their details. Important: Please ensure that the 'allow multiple children to register' box is checked, within the settings of the registration form. This will prompt members to choose how many members they want to register and allow the product discount to work.